Would you like to create your own custom form templates? Custom templates allow you to create and use your own unique ‘starter’ forms. If you tend to use many of the same fields and settings in your forms, or if you want to use the same form across multiple sites running WPForms, this can be a huge time saver. To begin, we need a form that will later be copied for our template. You can use an existing form or you can create a new form. 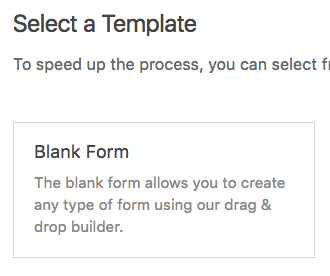 When creating a new form, you can choose to either start with a blank form or an existing template. For this example, we’ll build use the existing template named Simple Contact Form. The template title can be added on this screen in the Form Name field. Now that you’re in the form builder, we can add a form description under Settings » General. While a regular form’s description would likely include a message for a site visitor, a template’s description should include anything a person using the template would need to know (most importantly, the intended purpose of the template). After adding the description, you can customize any aspect of this form. This could be simple changes, such as adding fields. You could also make bigger adjustments, such as creating a multi-column layout, adding conditional logic, or customizing notification emails and confirmation messages. Anything that you add or change in the form builder will be included in the template. Now that you’ve set up your form, we can create a template from it. First you’ll need to get your template’s code by going to WPForms » Tools and clicking on the Export tab. On that page, scroll down to the Form Template Export section, which provides a dropdown list of all of your forms. All you need to do is select the form you just made and click the Export Template button. The template code should then be created and displayed on your screen. Copying and pasting this code to your site files will allow this template to be displayed in the form template list. We will discuss three options for adding this code to your site. For all of these options, you’ll first need to make sure you have access to your site files. If you would like the easiest and fastest solution, this is the way to go. You’ll need to open your site’s functions.php file by going to /wp-content/themes/YOUR-THEME/functions.php in your site’s files. Then you can copy and paste the template code into functions.php, save the file, and you’re all set. Note: Keep in mind that any custom code in functions.php can potentially disappear if you run an update for your theme. The best way to avoid this is to use one of the other two options or create a child theme. This is very similar to the first option, except that you will put the template code in its own file. This will help to protect it from accidental changes and keep your site code more organized. This tells your site to run the code in a file named wpforms-custom-templates.php. Next, we need to make that file. Be sure to create it in /wp-content/themes/YOUR-THEME/ (the same folder as functions.php). 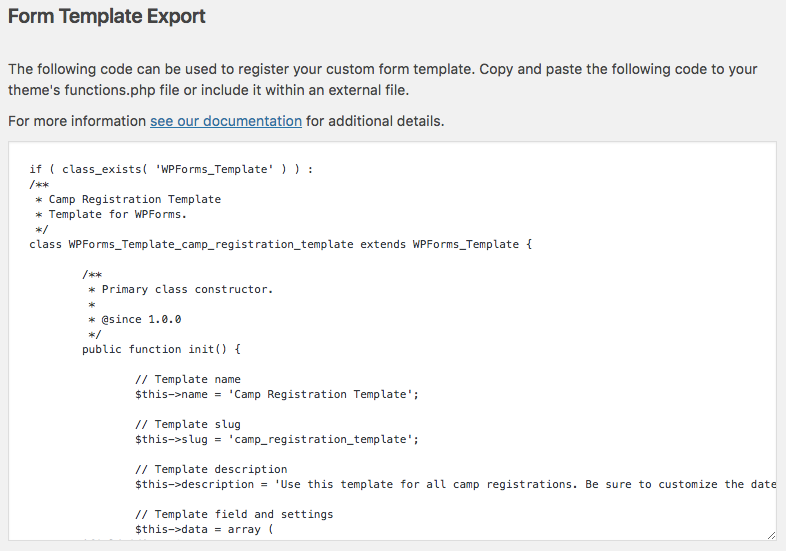 Lastly, you’ll need to paste the template code into the wpforms-custom-templates.php file and save it. This is the best option if you expect to change your WordPress theme in the future or want to use the same template(s) on multiple sites. * Description: This plugin loads custom form templates. Replace // Template code here with the generated code and save the file as wpforms-custom-templates.php. Open your site files and navigate to /wp-content/plugins/. You can add wpforms-custom-templates.php to this folder. In your WordPress site, open the Plugins page. There should be a plugin named WPForms Custom Templates. Go ahead and activate it. Now that you’ve completed one of the three options described above, your template should be ready to go! To check that everything is working, let’s try making a new form by going to WPForms » Add New. Under the Additional Templates section, you should see your custom template, including the form title and description you made earlier. For the last step, you can delete the original form if you like. The template doesn’t rely on the original form in any way, so it’s only necessary to keep if it has associated entries that you need. To delete the form, you can open WPForms, hover over the form’s row, and click Delete. That’s it! 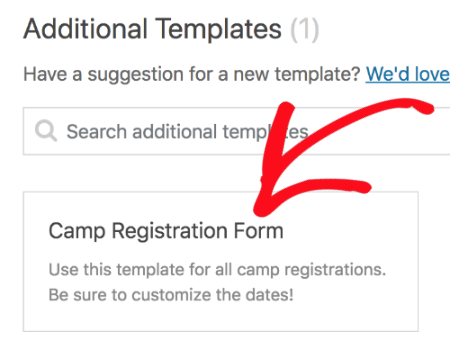 You can now save time by making your own custom form templates. Want to customize your forms even more? Check out our guide on how to customize your WPForms validation messages.